If the race for the Ulster GAA Writers merit award had been chalked up by the bookies in the same way as Saturday’s Grand National, Damien Casey would have been way down the list of odds, but shrewd followers of the Tyrone senior hurling squad may have made a good few bob, because the young Dungannon and Tyrone has been named their winner for March. The 21 year old Tyrone captain has proven to be one of the leading hurlers in Ulster this national league campaign with his scoring exploits, a total of 1-57 in the division 3A campaign, key to the Red Hands’ success in winning the title last weekend. Eoghan Ruadh man Casey, who is studying accountancy, received the award at McAleer’s Bar in Dungannon on Tuesday night from UGAAWA chairman John Martin, with County chairperson Roisin Jordan and Dungannon club chairman Tomas Colton also in attendance. It was a memorable occasion for the Tyrone talisman as he was joined by family members and Dungannon team-mates at the presentation. 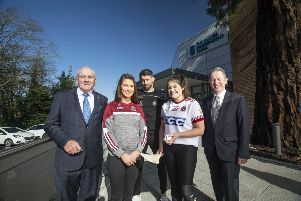 Casey, who has now captained Tyrone to the Nicky Rackard cup and two national league titles in a year, was delighted with the award, saying it was the perfect way to wrap up a memorable week.